The latest 'Munch & Listen' lunchtime talk at Bruce Castle Museum took us from King Alfred to King James and shed light on Tottenham's great scholar, mathematician and linguist the Vicar William Bedwell. 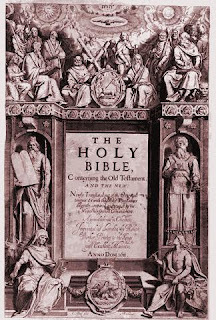 William Bedwell, the vicar of Tottenham from 1607 to 1632, was one of the scholars commissioned to translate a new version of the Bible into English by King James I. What with deciphering Aramaic, Hebrew and Ancient Greek this was no small feat and he was one of 50 men entrusted with the mammoth task. Bedwell was engaged in the 'First Company of Westminster' responsible for the first bit: Genesis up to Two Kings. The Vicar also wrote a history of Tottenham which included an 'ancient poem' called 'The Tournament of Tottenham' - you can see them both at Bruce Castle Museum. "Here lyes interred in this chancel Mr. William Bedwell, sometime vicar of this church, and one of King James's translators of the Bible, and for the Easterne tongues as learned a man as most lived in these moderne times. Aged 70. Dyed May the 5th, 1632." It was Peter Brown, a historian, writer and illustrator who gave the talk at the Castle and vividly brought to life the great religious debates which led to the new King James version. He also brought a very rare Bible of his own for us to look at and his own illustrated history of the Augustinians of Aldgate, Tottenham and Palmers Green. Spring's family events kick off at the Castle from Sunday April 6th.